Tony, our neighbor, died a few weeks ago. A longtime resident, he was known to many in our city of Beverly, Massachusetts. He was a tall, good-looking guy with an easy laugh. He had the gift for storytelling and telling a joke. He loved to see people laugh. Friends called him ‘Tall Tony’. Tony also struggled. His alcoholism, led to a life of living on the streets. His disease took a toll and contributed to his death at age 59. What is uncommon, is how the city I live in, responded to Tony’s life and death. In many cities we walk past those who live on the streets. They are seemingly invisible. In Beverly, you’ll find the ‘White Whale’, a little house that provides daily meeting space for AA and NA groups. To honor Tony, they created a Facebook page to honor and mourn his death. 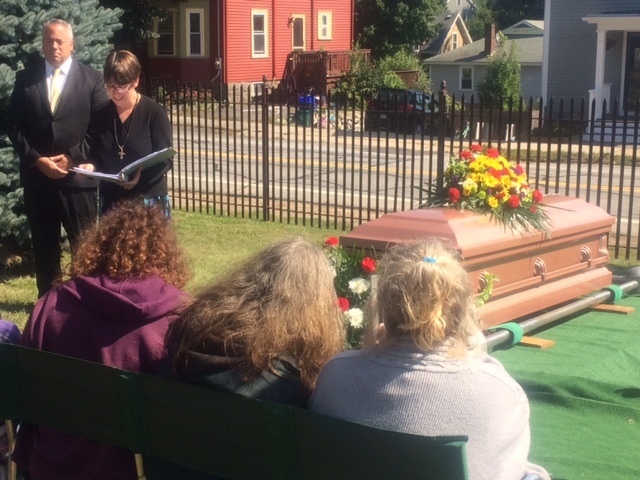 ‘Friends of Ellis Square’, a collection of neighbors who provide weekly meals and friendship to neighbors in need, organized to provide a respectful send off for their friend. Local churches of various faiths, provided food, meeting space and finances to help cover the cost of the funeral. Campbell’s a local funeral home donated their space and staff. Pastor Valerie offers words of blessing at Tony’s committal service. My contribution was to drive Tony’s friends in our church van to the funeral. Following the eulogy, prayers and singing at the Funeral Home, our van took its place in a procession to the cemetery. A homeless man dying in America is sadly an all to familiar story. What is remarkable, is how our community offered a different response. Tony was remembered, even honored in death, because he was known and valued in life. I think that’s the key to our well-being as a community. We see each other. We know each others name. It is hard to be indifferent or unkind as we get to know each other. When we allow ourselves to become friends. Nobel Peace laureate, Desmond Tutu said: ‘The moral health of a community is measured in direct proportion, to the compassion we show towards those among us who are most vulnerable.” By such a measure, our town is making progress. Thanks Tony, for refusing to hide in the shadows. Thanks to the neighbors, recovery community, churches who got to know Tony by name and honored him in his passing. Rest in peace Tony. You are missed. Three cheers for Beverly MA. Three cheers for you and your church! The world needs more good stories like this one!